Amish Built. High Quality. Direct from the Manufacturer. We are loaded and ready for you to stop by to look through our inventory. Our lot is always open to browse! Visit during business hours to talk to our Shed Professional or make an appointment after hours. Shed Superstore! Come see the largest selection of Storage buildings in SW VA! 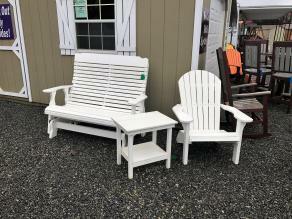 Large Selection of High Quality outdoor furniture and ornamentals! Customize your building and Furniture to match your home! Located at 2733 Peters Creek Rd. in Roanoke! Beautiful Buildings for your backyard needs and high Quality furniture for outdoor fun! Come by and see our large selection of Premium quality buildings built the Amish way! We use the best materials and proper construction practices to build the best storage units available in the market today! Customize your building with made to order colors and options! With 9 standard roof designs, 9 different sidings and ability to modify these features, you can add electric, workbenches, shelves, extra windows, sky lights and dormer windows. 15 Months 0% interest Visa, fixed rate installment upto $55,000.00, and Rent-to-own on select buildings upto $8000.00. Visit our store, call 540-562-3150, or visit us on Facebook! We have several Bargain Corner items available. They are discounted for various reasons... repos, older stock, overstock, etc. All structures listed in the Bargain Corner are sold AS IS (with NO top-to-bottom Warranty from Pine Creek Structures) and will require 4 payments down if you choose our rent to own program! Pine Creek Structures builds structures better! 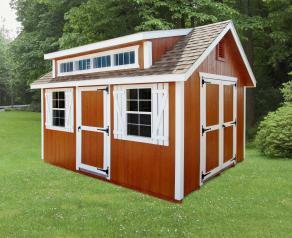 6x8 HD Tall Peak Shed with Extras!